Series Mania and UGC, one of the largest cinema operators in Europe, are happy to announce their partnership regarding the newly named UGC Writers Campus by Series Mania. 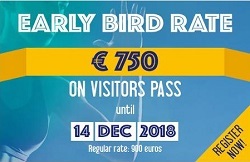 Formerly known as Series Mania Writers Campus, this program is organized to kick-start the next generation of European series creators. For the next three years, UGC will sponsor this English-language, high-quality and immersive writing workshop for 20 emerging TV drama writers throughout Europe. Participants will experience an intensive week surrounded by the best authors taking place along Series Mania. Under the editorial supervision of Lorraine Sullivan, the first edition of UGC Writers Campus by Series Mania, in partnership with Paris College of Art (France) and the SACD, will run from March 20-27, 2019. The Telco Report is accepting program listings for our upcoming NATPE 2019 edition. Please see our website for further details. The deadline for the NATPE special edition is Friday, January 4, 2019. Please note that we publish year-round and that new program listings are welcome any time. “Oasis—A Love Story” is a scripted drama format about a young woman who is unwanted by her parents. Saddened by her unfortunate life, she attempts suicide by jumping off a bridge. Unsuccessful in her endeavor, she is befriended by a police detective who immediately takes her to the hospital. Upon waking up in the hospital, she realizes she has been unidentified and thinking she might be able to live a different life she pretends to have lost her memory. The detective, who recently lost his wife, decides to take care of her until she regains her memory and invites her into the family home with his three children. A story that started from a lie turns into an unexpected happy ending with a family she could only hope for (60’ format). 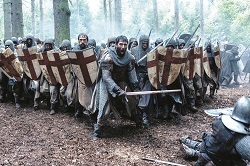 Starring Tom Cullen, “Knightfall” goes inside the medieval politics and warfare of the Knights Templar, the most powerful, wealthy and mysterious military order of the Middle Ages who were entrusted with protecting Christianity’s most precious relics. The story of the Knights Templar has never been fully told until now, and “Knightfall” goes deep into the clandestine world of this legendary brotherhood of warrior monks to learn who these knights were, how they lived, and what they died believing (season 1: 10 x 60’, season 2: 10 x 60’). San Francisco-based salvage expert Michael “Bug” Deakin and his team of craftsmen hunt for history-rich materials to repurpose into timeless pieces for clients’ homes in the new DIY Network series “Heritage Hunters.” Premiering on Sunday, November 4, Bug transforms reclaimed wood from forgotten centuries-old structures. He finds valuable materials such as redwood board-and-batten walls, oak wine staves from a local winery and fragments of hand-hewn Amish barns. From these fragments he creates beautiful kitchen islands, dining tables, porch spindles and exposed beams for ceilings. The action-packed premiere episode showcases Bug and his crew as they salvage historic bleacher boards from the famous Polo Fields in San Francisco’s Golden Gate Park and craft them into rustic kitchen shelves. The team also revamps an outbuilding on a client’s property into a relaxing retreat by adding a bar built with scrap from a shuttered local restaurant that was a favorite of the family (10 x 30’). 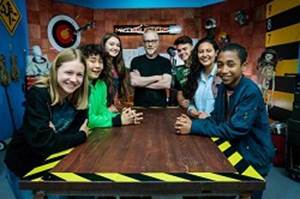 Adam Savage returns to television as host and executive producer of “MythBusters Jr.,” when the new Science Channel series premieres in January, 2019. For the ten-episode series Savage has teamed-up with six of the nation’s leading young ‘makers’, robotics wizzes, builders, and inventors, all under the age of 16, who show off their amazing ingenuity and STEAM (Science, Technology, Engineering, Arts, and Math) skills. Together, they tackle myths just like those seen in the popular Emmy® nominated television series “MythBusters,” ranging from driving, explosions, movies, popular culture and more. From building a fire extinguisher jetpack, to dominos big enough to crush a car, and testing myths from the Oscar®-winning big screen pic “Gravity” and TV’s “Breaking Bad,” it’s an action-packed season. (10 x 30’). Big Bad Boo Studios new preschool animated series, "16 Hudson," follows Lili, Sam, Amala and Luc as they embark on small adventures in a big city while showing us what friendship is all about. Holiday specials celebrate Chinese New Year, Diwali, and Persian New Year through the eyes of these kids. "16 Hudson" has been noted for its inclusivity-featuring characters from Persian, Chinese, and Indian backgrounds as well as representing the LGBTQ+ community (39 x 7’, + 3 x 7’ holiday specials). Featuring Bajrangi, the child version of the eternal mythical character, the Indian monkey God Hanuman, “Selfie With Bajrangi” follows his adventures as he comes alive in the contemporary world. The animated series uses humor to teach problem-solving and the value of friendship (104 x 11’). In the new docu-series, “The Devil Next Door,” Spindale, North Carolina looks like an average American town but what was once a quiet community is now the epicenter of a federal criminal investigation involving alleged fraud. Former members have reported, to the press, allegations of physical and mental child abuse, forced labor, intimidation and separation of children from their parents, but the Word of Faith Fellowship Church denies any wrongdoing. The Church began in 1979 and is led by 77-year-old Jane Whaley, with additional churches in Ghana and Brazil. While the Word of Faith Fellowship affirms to be a devout Christian church, former members tell a different story: one of violence and exploitation. This series will follow many former members as they work tirelessly to make the community and the government aware of the injustices going on behind closed doors. It’s the mission of these former members to convince those still inside, including their own loved ones and children, to break away from the Church (6 x 60’). Focusing on the life of one of history’s most influential women, “Maria Theresa—Europe’s Mother-in-Law” examines Maria Theresa’s long and eventful reign as Empress of Austria. The empress arranged her children's marriages to make peace with France, Spain, Parma and Naples. One of these children was Marie Antoinette, who married Louis XVI of France before they were both decapitated. Needless to say, these marriages were largely unsuccessful. Watch as Maria Theresia struggles to balance dynastic responsibility and motherly love (52’). Pernel Media has appointed ZDF Enterprises to distribute its ground-breaking series “Monumental Revelations” in all territories outside France and UK. The four-part series takes a unique approach in delving into engineering mysteries behind some of the world’s largest and most famous ancient structures, revealing the secrets behind the Great Wall of China, Jordan’s archaeological gem Petra, the Incan citadel of Macchu Pichu and the French island commune of Le Mont Saint-Michel. Each episode explores the history and secrets of the landmarks by observing them from different perspectives of scale – from satellite imagery from space and aerial views right down to macro and microscopic levels. From each perspective, “Monumental Revelations” reveals data that helps shed new light on invisible historical and construction enigmas that have baffled historians for years (4 x 60’).